Los Lagos Hotel Spa Resort combines the natural drama and beauty together in a private garden of air, water and fire. 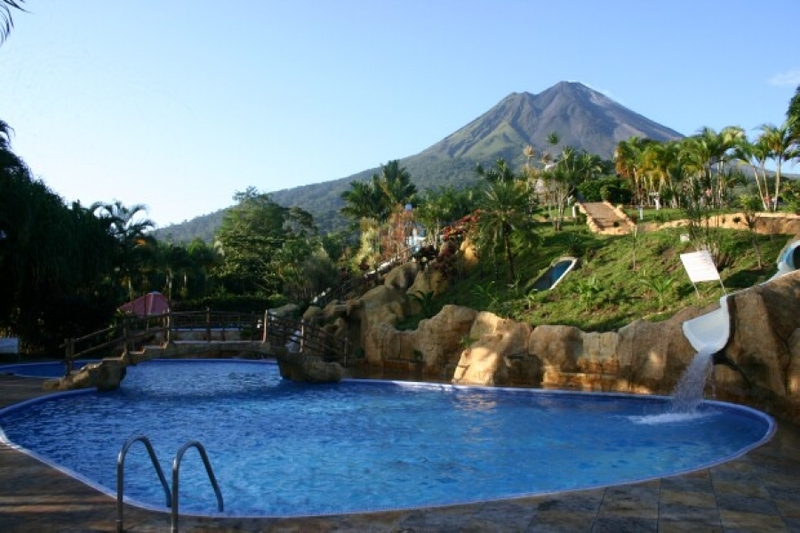 Los Lagos Volcano Resort is 1050 acres of tropical forest and wide landscapes, clear, safe and spectacular view to Arenal Volcano, wide tropical gardens with butterflies, frogs, crocodiles and leave cutter ants. An exclusive resort with its own 13 platform canopy tours, horseback riding tours, and spectacular observation point at the property, other facilities is an exclusive spa facing a primary forest and surroundings of water and their signature Arenal volcano clay wrap. At Los Lagos Resort we offer 8 different pools, 5 with natural hot springs and 4 regular water pools available. The hotel offers 98 rooms, international restaurant, souvenir shop, tours, wet bar, and free internet. Los Lagos Hotel Spa Resort is the most comprehensive, peaceful, adventurous and restful place that you can find in the Arenal Area. Standard Hotel Rooms fully furnished with 1 double size bed, with an additional rollaway bed; and some of these rooms with 2 double size bed (with its rollaway beds). Roomy and quality decorated, will facilitate you to appreciate the Arenal Volcano in a handy way, while receiving the fresh and pristine air from the Costa Rica Tropical Rainforest. Superior Hotel Rooms you can enjoy your trip relaxing or reading, while staying at the hotel. Fully furnished with 2 queen and 2 rollaway beds. Roomiest and quality decorated, all have big windows to appreciate the Arenal Volcano from inside, or a comfortable big terrace to see it at outside, while receiving the very fresh air from the Costa Rica Tropical Rainforest. An impressive view to San Carlos’ plain is also available. Premium rooms enjoy a wide range of amenities for your comfort. Our premium rooms eats three fully Furnished with all possible elements to provide a pleasant experience. The Lakes Hotel is pleased to welcome all those who wish to spend their honeymoon or anniversary in our facilities, being offered them a unique experience in a natural environment. We offer a fully customized stay to provide an unforgettable experience. We include canopy tours, romantic dinner, horseback riding and other services that will make your stay memorable. The natural hot springs at the Los Lagos Hotel, Spa & Resort receive their water supply directly from pristine rainforest springs, and are natural looking hot tubs, strategically placed to receive the continuous flow of hot fresh water, full of healthy minerals, from the Arenal Volcano’s underground heat source to your body! Relax and have healthy fun every time you enjoy our natural hot springs during your Costa Rican vacation. Swim Up Bar: With the Arenal Volcano as an impressive natural background, enjoy the refreshing beverages and tropical fruit at our Lemnos Wet Bar, blending the pleasant and relaxing warmth of a hot spring, with the happy and musical atmosphere of this hotel bar. Hot Springs: The therapeutic uses of natural hot springs can be internal or external, ranging from water treatments (hydrotherapy), to medicinal clay (geotherapy). Applied as a mask directly on the skin, clay releases excess body heat and absorbs toxins and other secretions.